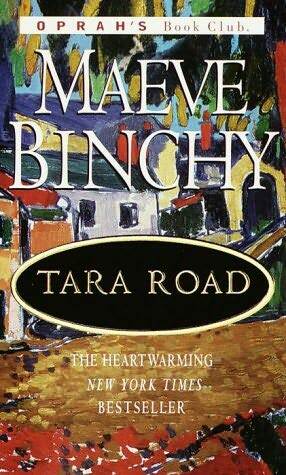 Tara Road, by Maeve Binchy, is primarily a story about women. Kind women, cruel women, homemakers, career-minded, wounded, and strong. Our main character is Ria, who grows up modestly in Dublin with her mother and sister. Tara Road basically tells the story of her life as she moves from teenager to working young woman to exuberant newlywed to mother—and details all of the dangers and joys along the way. Against all odds, two newlyweds manage to buy the house of their dreams. In 1982, property speculation is beginning to be a big, big thing in Dublin–and their street is very much in an up-and-coming part of town. But for its various inhabitants, the street is to become a boulevard of dreams–some broken, others created anew. Maeve Binchy has long proved herself a secure hand at multiple story lines, and over the course of 500 satisfying pages she focuses on Ria; her best friend, Rosemary Ryan, a beautiful, endlessly selfish career woman; Gertie, the battered wife of a drunkard; and several other intriguing women, each of whom has secrets not to be shared. After our supposedly happy housewife and mother of two is confronted by some inexorable home truths, a chance phone call from America will change her life, forcing her to discard her illusions about men, women, and marriage and start all over again. At the same time, the Connecticut caller, Marilyn Vine, has her own lessons to learn when she and Ria swap houses for the summer. Instead, Tara Road is a stirring look at the reality behind our consuming fantasies, and a page-turner to boot. SO now you know the story. My take on it: If you’ve seen the movie The Holiday, you’ll recognize the plot, but Binchy brings the dramz like no other. It’s actually a suspenseful read, what with the affairs and the shady business dealings and the DRUGS that come out of nowhere! Who ever said only thrillers could keep you on the edge of your seat?? Our other main character, Marilyn, is also well-done, though I would have liked her to be introduced earlier in the novel—it’s very Ria-centric. It’s only when Ria’s life goes down the drain that Marilyn enters the scene, perhaps more than halfway through the book, so it feels a bit unbalanced. I love that both of their relationships—with their husbands, children, and friends—seem real, messy, and complex. For example, Ria’s mother always drops in unannounced; she considers yelling “Ria!” by the front gate enough advance warning. And, like, isn’t that something your mom or your friend’s mom totally does?? So yes, +1 for great characters and character interactions. Obligatory complaining: Binchy broke my heart with the character of Rosemary. She’s this powerful, collected, intelligent woman, one who was happy with the choices she had made, and who had succeeded in the male-dominated business world on her own terms. Near the end of the book, you discover (with what feels like a punch to the gut) that Rosemary has been doing something Very, Very Bad. And it just destroys any goodwill or admiration you might have had for her. Bookwanderer Tagline: Life gets worse before it gets better—hang in there. Maybe you should take a trip!